Everybody has a sob story about a favorite item of dry clean only clothing that got ruined when it went through the washer, either accidentally or on purpose. In my case, it meant goodbye forever to my chic black pencil skirt. After it went for a warm water swim in my washing machine, I could never wear it again. The finish was trashed, the lining was weirdly lumpy, and it wasn’t my size anymore—an all-around fail. But that was before I knew that there’s a right way to clean dry clean only clothing at home. Believe it or not, you can wash most garments with a dry clean or dry clean only tag—you just need to know how. If the tag just says dry clean you can probably ignore it and hand wash the clothes carefully at home. Even when the tag says dry clean only you’re not locked in. Manufacturers often stitch that tag onto clothes because they think dry cleaning works to keep them looking new longer. But you can often clean them at home just as well as the professional dry cleaners can. There’s a right way to wash dry clean only clothing at home, so you can save time and money by doing it yourself. Are you wondering whether there are some things best left to the pros to clean? Yes, your vintage beaded top deserves expert attention. The only suede you should ever try to wash at home is a pair of UGGS—everything else goes to a leather cleaner. Clothing made of real fur should stay out of the water, and rayon (AKA viscose) does not usually wash well. Still, if you follow our instructions, you can clean more of your clothes at home so you can save time and money. 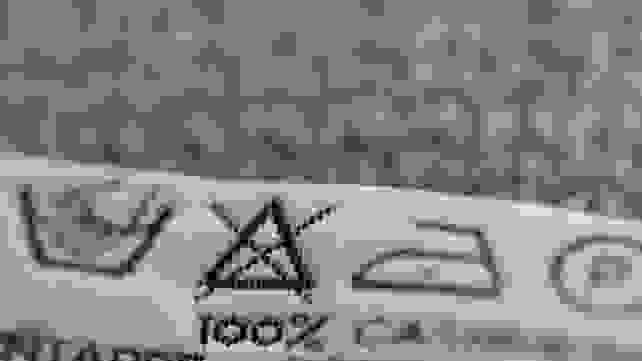 Even if you plan to defy it, take a long look at the care tag before you wash, and understand what the symbols on it mean. Doing that will tell you the fiber the clothing item is made from and help you decide the method you’ll use for cleaning clothes. Always check the tag before you wash. It will tell you what fiber the garment is made from and show you symbols that explain how to care for it. So, ready to get started? These fabrics are almost always fair game. Our guide to cleaning every kind of fabric provides detailed directions on how to wash them. 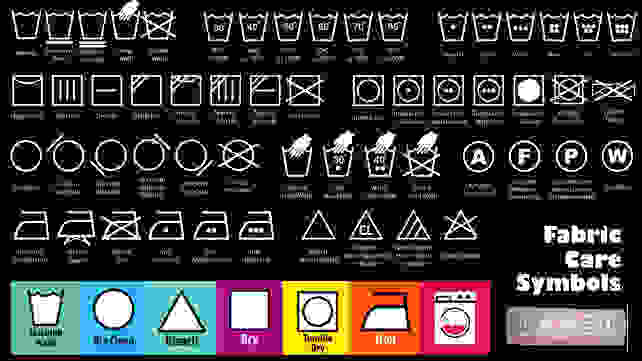 You don’t have to memorize the fabric care symbols, but definitely keep a chart like this handy when you’re washing your dry clean only clothing. Now, test for colorfastness. Silk fabrics are especially prone to losing color when washed. Find an inconspicuous section on the wrong side of the garment (inside a seam is good) and dot on a bit of water using a Q-tip or a white washcloth. Rub very gently. If any of the dye comes off, stop right there. 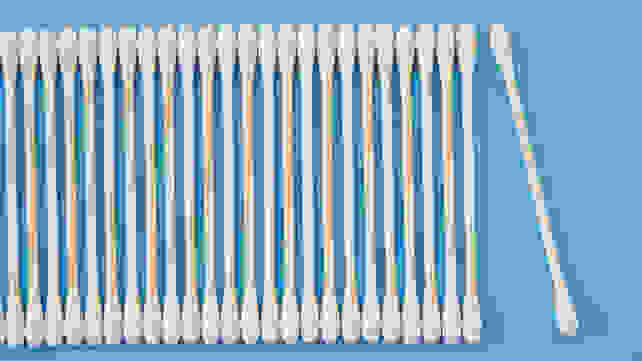 If there’s no dye on the swab, move on. 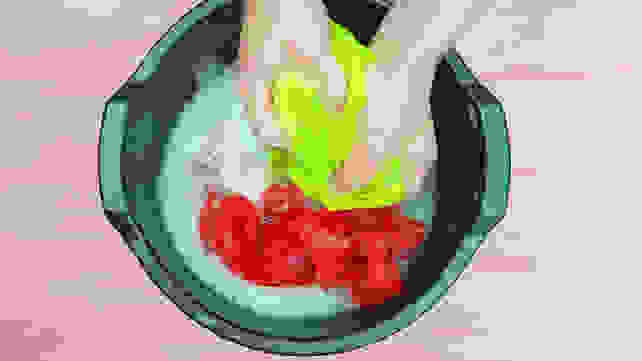 Use a white washcloth or cotton swab to test clothing for colorfastness, because you don’t want the color to run when you wash it. Silk is usually washable, but since it is not usually colorfast, it can be risky to wash.
Ready to wash your clothes? Pick your washing method carefully. Here’s how to deal with delicate duds. Start with a clean sink or basin when hand washing. Swish carefully in cold water to keep each article of clothing, especially sweaters and other knits, looking beautiful. Part of good care is selecting the right detergent for the job. Don’t automatically go for detergent you pour into your washer. A mild detergent will give far better results. Whether you favor a few drops of baby shampoo, a small amount of Woolite, or a squirt of Eucalan, it will treat your clothes more kindly. Drain the soapy water out, refill the basin for a cold water rinse and press out the suds till the water is clear. Hand wash delicate clothing using a mild detergent instead of the stuff you usually pour in your washer. Treat them gently, or you might wish you’d taken your clothes to the cleaners. Select a cold water delicate or wool cycle on your washing machine, and for best results, tuck each clothing item into a separate mesh bag. Pull your laundry out of the washing machine as soon as the cycle ends. Some more delicate clothes are safe to machine wash if you put them in a laundry bag before you pop them in your washer. Turn them inside out before you do. A delicate cycle can leave lots of water in the clothes. That’s on purpose—it doesn’t spin them hard. Step away from the dryer—these clothes are not going in there. Lay each wet garment on a towel. Roll up the towel with the clothing inside, pressing gently to remove water. Unroll the wet towel and move the garment to a dry towel. Then, lay it flat to dry. If your dry clean only clothes aren’t filthy, steaming is a great solution. At the very least, a good steaming will extend the number of wearings you get between cleanings. It’s chemical-free, kills most germs, and quashes odors, according to The Laundress. Hold the steamer over the garment, going from top to bottom. If there’s a lining, steam it before you do the outside. Be cautious, because a steam burn hurts. Don’t even think of steaming clothes while you have them on. Don’t panic! We’re not suggesting that you take your cherished clothing for an unprotected spin in a hot dryer. We would never do that. 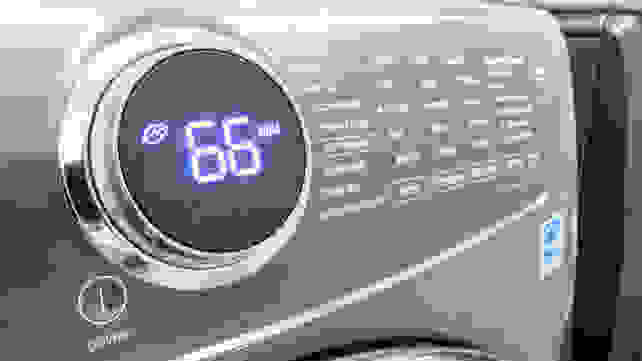 But if your dryer has a steam refresh cycle, you should use it to perk up a lightly-soiled garment. It’s not a true wash, but fine for stuff that’s not really dirty. If you’re fortunate enough to have a dryer with a refresh cycle like this Electrolux model, you can give dry clean only clothes a quick shot of steam. 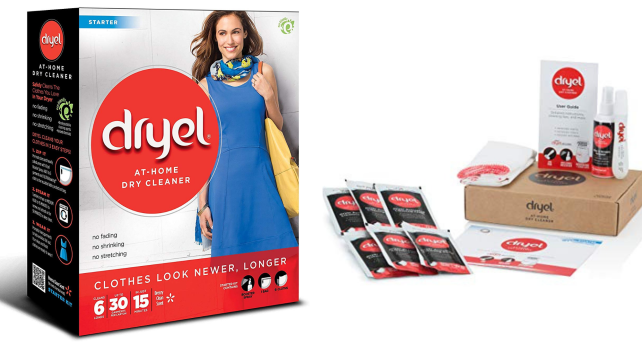 Kits like Dryel’s can be safe for clothes as long as you follow the directions to clean at home. The reusable cleaning bag steams your clothes. Martha Stewart says these clean at home kits do a refresh, are good for removing water-based stains, and that the clothes come out soft and unwrinkled. But don’t toss in your good navy blazer in the bag and plan wear it to a job interview that same day. 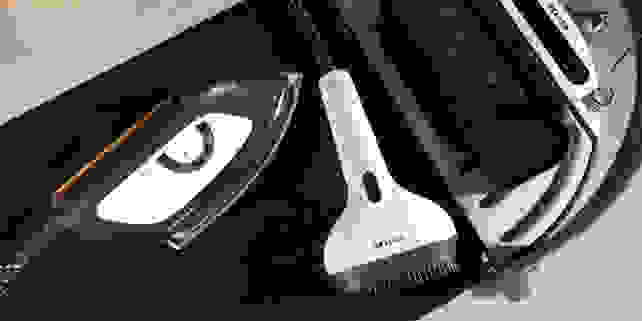 It will need pressing before it’s fit to wear, and you’ll also have to give it a thorough airing before you put it on to get rid of the kit’s perfumey smell. If you’ve got some money to invest in at-home wardrobe maintenance, you have more choices. I know these appliances aren’t for everyone, but if you can afford them, they can provide great alternatives to professional dry cleaning. 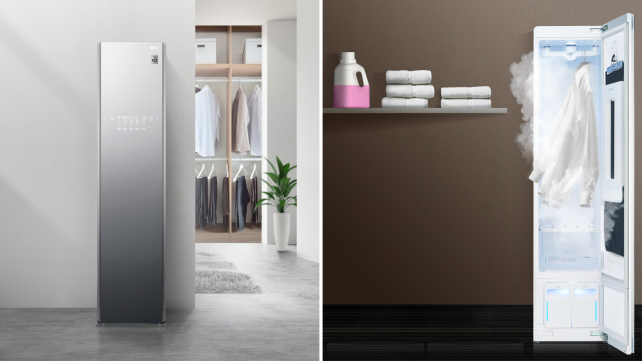 The LG Styler is a personal Wi-fi-enabled steam closet that refreshes clothes effortlessly. Vibration and steam smooth out wrinkles and reduce odors. The Styler will even crease your pants for you, if you care about that kind of thing. 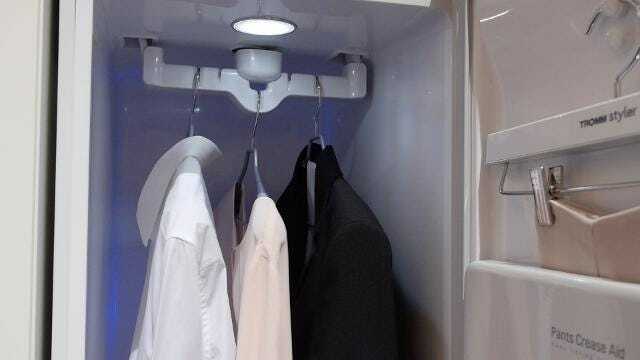 LG makes a steam closet for your business clothes. It will also crease your suit pants if that’s your jam. The Miele FashionMaster is a high-end iron and ironing board with powerful steam to freshen and smooth all your clothes. I tried it once and fell in love. The Miele Fashion-Master can iron and steam as well as the cleaners, for those who have $2000 to invest in it. If you can’t afford a top-of-the-line solution and don’t want to jump through hoops for your dry clean only clothing, there is one last choice—don’t buy clothes that demand it. Should I turn off motion smoothing?